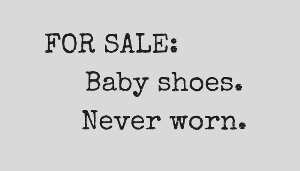 "For sale: Baby shoes. Never worn." It's been said that Ernest Hemingway wrote this six-word story. While its origins may be disputed, you can't argue with the fact that those six simple words do tell a story. What about you? Could you tell a story in six words? How about 140 characters? If you're looking for "short" story inspiration, you can check out the #140novel hashtag on Twitter, or read some famous authors' Twitter novels online. Speaking of Twitter, they recently increased the number of characters per tweet from 140 to 280. Tell me this. Just because you can say more, should you? The same question holds true for grants. If you're writing an online application and the response allows 300 words, do you need to use all 300 words? If it's a paper application, and you're allowed 5 pages, do you need to fill every page? And what about your donor appeals? What's the right length of the fundraising materials you write for your nonprofit? ARE YOU WRITING A GRANT PROPOSAL? I have experience here, as someone who used to read proposals for a living (I was a program officer) and also as someone who's written many winning grants. It is not necessary - I repeat, not necessary - to use every character, every word, or every page that you're allowed. 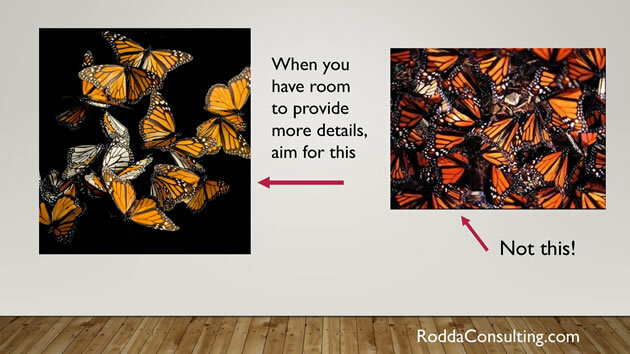 Of course, you want to answer grant application questions clearly and concisely. And you want to present a compelling case. That said, using more words does not improve your chances of getting more money. My colleague, Julie Rodda, uses this example to illustrate this point. Imagine these butterflies are your words. You can see why you wouldn't want to keep adding words to your grant proposal, just to fill the available space. Julie says, "Our tendency is to try and impart everything we think our reader might find helpful. Yet, when presented with volumes of text, our reader will simply skim and potentially miss what we wanted them to see." Now, what about the opposite? What if you find yourself challenged by space limitations? Like an online grant application with a character limit or a word limit? What do you include? Julie suggests, "The most important parts... with just enough context to give them value. Your readers really won't miss all the rest." And when all else fails, remember Hemingway's 6-word story and the 140-character Twitter novel. If others can convey a meaningful message in so few words and characters, you can do it, too. ARE YOU WRITING A FUNDRAISING APPEAL? I bet you've already mailed your year-end appeal letter, and that's great. But don't stop there. To maximize your giving results, it's a best practice to send both a letter and at least one email before December 31. Some nonprofits will follow up with two or more emails. And here's another tip: If you want to raise more money each year, a simple way is to ask more than once. Yep, that's right. You can - and you should - send more than one appeal letter per year. Many donors will give, more than once a year - if you're doing a good job communicating and demonstrating impact...and if you ask. If you're writing a letter, longer is better. Studies have found that long letters outperform shorter ones. In The Fundraiser's Guide to Irresistible Communications, Jeff Brooks devotes an entire chapter to this subject. One reason why longer works better? You want to tell a compelling story. One that draws your reader in - and inspires her to give. A two-page letter (or longer) gives you the space to tell those kinds of stories. With a longer letter, you'll also have room to use more images. Pick compelling ones. After all, a picture really is worth a thousand words. If you're writing an email, shorter is better. Consider the fact that more email is read on mobile devices than desktops. You can tell the same stories as in your letters. You just need to make them shorter. Repurpose, don't reinvent. You don't need to write new stories - you just need different ways of telling them. Every social media site is different. Twitter is 280 characters now. Got images? Get on Instagram. And, of course, Facebook has its own fundraising platform. Know where your donors are, then use those sites to reach them. Using letters, emails, and social media is called a "multi-channel" approach. It's a best practice in fundraising campaigns. Not only does it help you reach a larger and broader audience, it can mean more money for your nonprofit. Whether you're writing a grant application or a fundraising appeal, one of the best things you can do is keep it simple. For instance, when I review and critique grants, I consider the 5 "C"s of editing. One of those C's is "concise." When writing to individual donors, the length depends on your medium. You want to write long letters and short emails. And don't limit yourself to just one "ask." The most effective fundraising will use a combination of messages and methods. And the most effective fundraisers will ask their donors for support all year long, not just at the end of the year. Now, if you've already sent your year-end campaign letter, consider this complementary strategy: a 3-email series to your donors. This short video from Steven Screen tells you how. Whether it's year-end fundraising, or next year's grants, pay attention to the stories you're telling - and how you're telling them. Make every word count. And make those words work for you. Need help telling your nonprofit's story through grants or appeals? Laura Rhodes can help.